Reedy Lagoon Corporation Limited (ASX:RLC) has informed the market that drilling at its wholly owned Columbus Salt Marsh project is progressing as scheduled. While difficult ground conditions were encountered during the first 150 metres, the drill has since passed 400 metres down hole and is nearing the highly conductive zone extending from 600 metres below surface (below). RLC expects to intersect brines within the above zone and plans to drill to 1,000 metres. 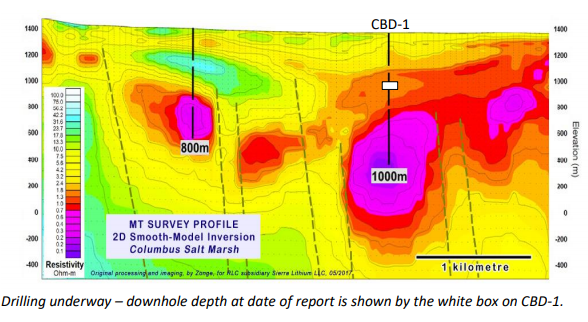 The company has also indicated that it intersected a tuff unit between 151-167 metres downhole, smaller thin tuff units have been discovered above and below this wider zone. 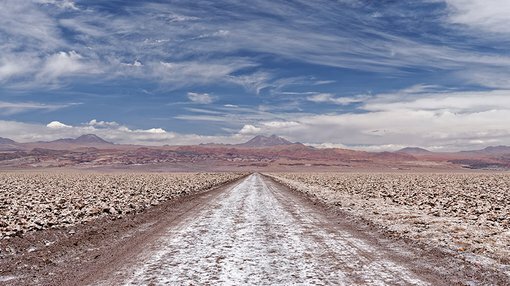 The presence of volcanic ejecta has established the possibility of dissolvable lithium discovery within the project. RLC’s programme will include hydrological testing to establish aquifer, brine composition analysis and brine extraction parameters. If results are favourable, the company may expand the diameter of the hole and convert it into a ‘monitoring well’. The well may be converted into a producing well subject to permit approvals. The Columbus Salt Marsh project is located 45 kilometres northwest of North America’s only producing lithium brine operation at Silver Peak. The Columbus Salt Marsh valley represents a close basin with extensive Tertiary volcanic deposits in the surrounding hills. The valley is fault bounded and several geothermal springs discharge alkali salts onto the lake surface, where they have been mined for borax in the past.